Usually when we think of the Christmas holiday, seafood is not the first thing that comes to mind. One of the things that does come to mind during Christmastime is tradition, and for some, such as Italian and Italian-American families, it is tradition not to consume meat the day before Christmas. Instead, families serve seafood for their Christmas Eve dinner, often referred to as the Feast of the Seven Fishes. The Feast of the Seven Fishes is believed to have started in southern Italy, and this custom was brought to the United States when families immigrated from Italy to America. Although it is called the Feast of the Seven Fishes, some families serve up to thirteen courses! What kind of dishes would be included in this feast you ask? See the recipes below to find out! Since there will be several hefty courses, it may be a good idea to start out with an appetizer. These bite sized Baked Scallop Scampi are perfect for the beginning of what’s to come. Don’t forget to pace yourselves! There is plenty of food ahead! A great second course would be a salad as you can start moving on to a more generous serving. 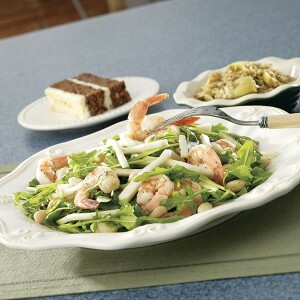 This Cannellini Celery Root Salad with Shrimp has a hearty flavor that pairs perfectly with a light wine like a zinfandel or a pinot grigio. The lemon juice and shrimp create the perfect flavor combination that will have everyone asking for more. For the third course, it may be time to dive into a seafood classic, the lobster tail. Our simple recipe for Broiled Buttered Lobster Tails only takes 15 minutes, including preparation time, which will give you more time to mingle with your guests and loved ones. Another meaty dish to add to one of your courses would be our Steamed Crab Legs. Yummy! What would an Italian feast be without pasta? Flavorful Scallops with Vanilla-Almond Cream Sauce includes a creamy sauce and savory scallops. Since this recipe calls for a cup of white wine, you might as well keep the whole bottle to serve for your family. It would complement the pasta perfectly. If you are a fan of combining fish and pasta our Rustic Pasta and Salmon Sauté recipe is a great choice! A festive feast like this would not be complete without something fried. This is where Breaded Calamari has its chance to take the main stage. The best part of this meal is that it can be served by itself or with your favorite dipping sauce. With this feast you don’t have to limit your fried courses to only one. Looking for another fried dish? Try our Pan-Fried Cod recipe. No feast is complete without a scrumptious dessert. If you are having trouble finding new treats to serve, you can try our Holiday Cookie Exchange. This recipe includes three different cookies so you have a variety of options. You can even task each guest with bringing different cookies for everyone to try! Does your family celebrate the Feast of the Seven Fishes or have other Christmas meal traditions? Let us know in the comments below! Matt L. started with Publix in 2010 and has bled green ever since. He loves the company culture and especially appreciates the opportunity to help customers each and every day. An avid reader, Matt most enjoys learning something new himself when he sets out to write a new blog post for The Checkout. Outside of work, you can find Matt playing video games, experimenting with new recipes in the kitchen, and hanging out with his cat – who is basically his spirit animal.